Ben Huberts - Heritage Funeral Homes Inc.
formerly of Moorefield passed away peacefully at Sunnyside Long Term Care in Kitchener on Monday, October 1, 2018 in his 89th year. 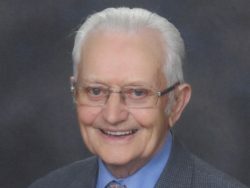 Ben was called home to his Saviour, Jesus Christ and has been reunited with his beloved wife of 55 years the late Tina (Tolsma) Huberts (2012). Dear father of Bill (Cheryl), Fran, Harry (Bernadette), Ed (Peggy) and Freda (close family friend). Opa will be deeply missed by his grandchildren Melissa, Stephanie, Ben, Jenni, Christie, Lyndsey, Jason, Brandon, Courtney and Blake, as well as by his 11 great grandchildren, Ian, Taylor, Megan, Summer, Britney, Caleb, Malina, Holden, Skyla, Lynncoln and Harper. He is survived by one sister, Bonnie. Family and friends are invited to attend a Funeral Service of Remembrance in the Drayton Christian Reformed Church on Saturday, October 6, 2018 at 1:00 p.m. with Pastor Rick De Graaf officiating. Private family interment in Drayton Cemetery. As expressions of sympathy, donations to Community Christian School or Fairview Mennonite Home, Kitchener, would be appreciated by the family.